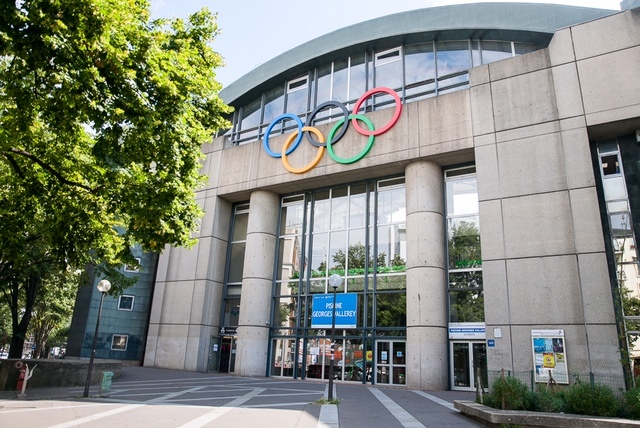 While the International Olympic Committee (IOC) is preparing to officially award the Games of 2024 and 2028, the Lausanne institution has authorized the City of Paris to use the Olympic rings on the a Parisian swimming pool. Property of the IOC, these rings are an illustration of the Olympic symbol whose foundation is defined by the Olympic Charter. Rule 8 of this document states that « the Olympic symbol expresses the activity of the Olympic Movement and represents the union of the five continents and the meeting of athletes from throughout the world at the Olympic Games ». By granting permission to use the Olympic rings, the IOC is therefore grateful to the Georges Vallerey Pool, named in honor of the bronze medalist at the London 1948 Games. The swimming pool, initially named Stade des Tourelles, has a rich history that explains this Olympic recognition. Located in the 20th arrondissement of Paris, the Stade des Tourelles was built for the reception of « swimming meetings » – to use the terms of the time – on the occasion of the Paris 1924 Games. Inaugurated on June 8, 1924, with festivities organized by the French Federation of Swimming and Rescue (FFNS), the Stade Nautique was the scene of the diving, waterpolo and swimming competitions from 13 to 20 July. History will remember in particular the participation of Johnny Weissmuller. Beyond the sports performances, the popular success of the event was noted, with 41,945 paying entries recorded, representing revenues of around 416,410 francs. These data allowed « swimming meetings » to be ranked third in the competition, after soccer (181,822 spectators and close to 1,8 million francs of revenue) and athletics (106,307 spectators and nearly 1,6 million francs) and before rugby (37,313 spectators for 367,264 francs of revenue). 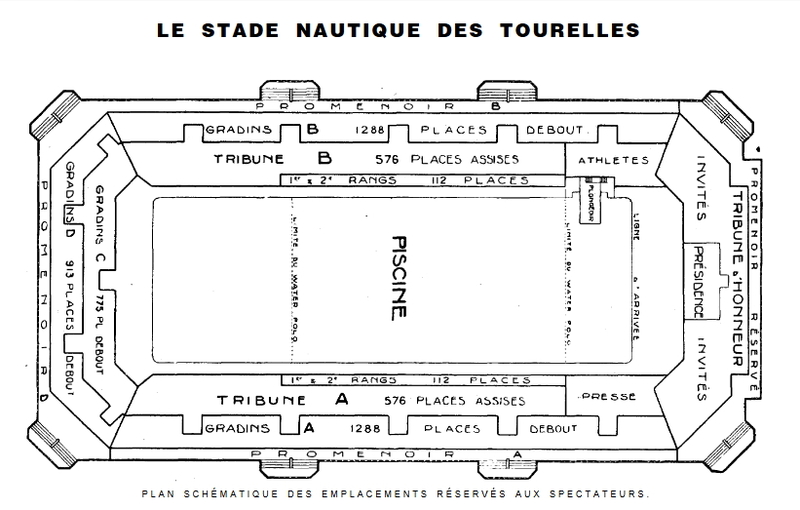 At the end of the 1924 Paris Games, the Official Report had distinguished the Tourelles stadium for its technical characteristics, particularly in terms of innovation. Nevertheless, despite this obvious satisfaction, the cost of construction and post-Olympic maintenance of the equipment have still weighed on the decisions of the authorities of the venue. In his book « Les Paris des Jeux Olympiques de 1924 » (volume 1) published in 2008, Thierry Terret said that « the pool of the Tourelles will have cost a sum close to the total national budget of physical education. As for its operation after the Games, the federal authorities agreed to deal with it until 1925, but the challenge is enormous : no cabin, no filtration, requiring a weekly water change, a cost estimated at 50 000 francs for the two summer months… it will in fact take several decades and many transformations to get closer to a balanced budget ». The management of the Tourelles stadium also influenced the decisions concerning the construction of swimming pools dedicated to competitions after the 1924 Games. Indeed, in the summer of 2014 as part of an interview with « Sport & Société », Louis-Frederic Doyez (CEO of the French Federation) had highlighted the lack of major infrastructure in France to host an international event. He then pointed out that « the last construction of a large-scale Olympic pool, particularly in Ile-de-France, corresponds to the 1924 Olympic Games ! Rome had retained the equipment of 1960, Moscow those of 1980. They made them evolve. Emerging countries without any practice of swimming have large venues. We have our pool of 1924, renovated in 1970. And we are therefore especially shame, embarrassment to note, explain it ». The lack of a flagship equipment in Ile-de-France region, despite three Paris Olympic projects for thirty years, has therefore imposed a real commitment by the authorities to ensure that France can claim to the future organization of the Games. Initially envisaged in Aubervilliers, the Olympic Aquatic Center will finally be built on the territory of Saint-Denis to host the competitions in 2024. The venue will host swimming, synchronized swimming and diving events. The Swimming Pool of Marville – built in 1974 and whose renovation is already planned – will be the Olympic Waterpolo Center. 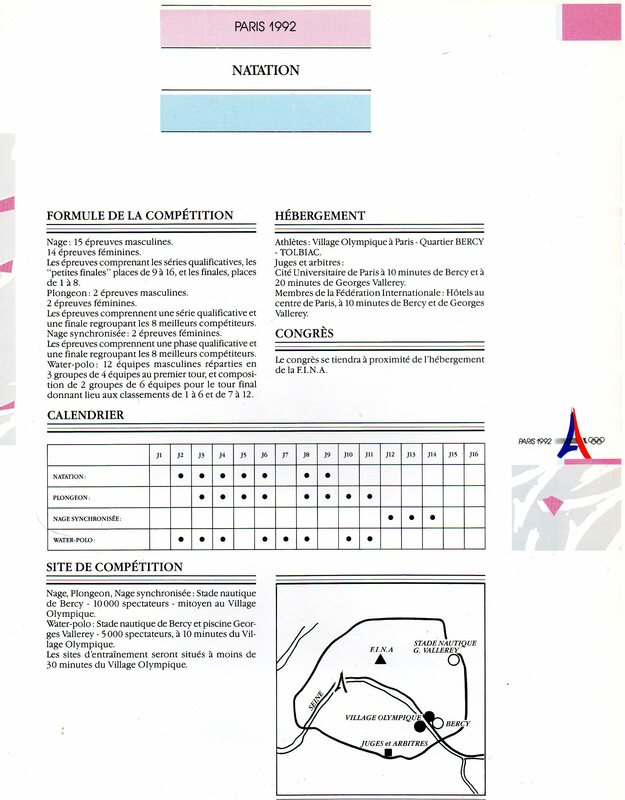 The reconversion of the two venues will have to consider the French example in the field of major events, as well as the planning of former Olympic cities such as London, which mastered the redesign of its Aquatic Center and the dismantling of the waterpolo venue in the context of the 2012 Olympics. For Paris 2024, the two sports facilities will become, after the Games, dedicated sites for schoolchildren, national teams (training courses, etc…) and of course for regional, national, continental or global competitions. Concerning the former Tourelles stadium, the equipment will be closed to the public between October 2017 and May 2018 to allow an upgrade of its facilities. A profound renovation had taken place in the mid-1980s. The former Tourelles stadium was then talking about its rich Olympic past. For his bid for the 1992 Summer Games, Paris had chosen to build a brand new 10,000-seat nautical stadium in the Bercy-Tolbiac district. The swimming pool of the 20th arrondissement – 4,000 to 5,000 seats planned – would have constituted an venue for the Olympic tournament of waterpolo.